Yellow is not a usual color that I use for my manicures, and for this spring I decided to try something more adventurous with the citrus hue. Lemon Sherbert is a sweet yellow nail polish from the Etude House Sweet Recipe collection. 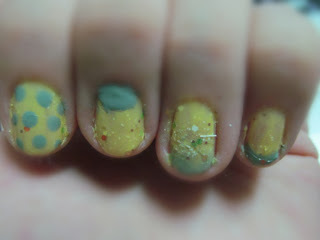 Here's some nail art using yellow as the main color! The colors used here are the the Dear My Deep Color Nails in Mink Mint (left) and #2 Lemon Sherbert (right) from the Sweet Recipe collection. The yellow shade blends well with the mint green, and they make an awesome combination for spring. I used the Lemon Sherbert polish as a base color, hence I applied 2 coats of it after base coat to make the yellow more vibrant. For a sheerer look, 1 coat of it will suffice. Here are the designs that I used for the nails. The thumb is a color blocking of yellow and mint. 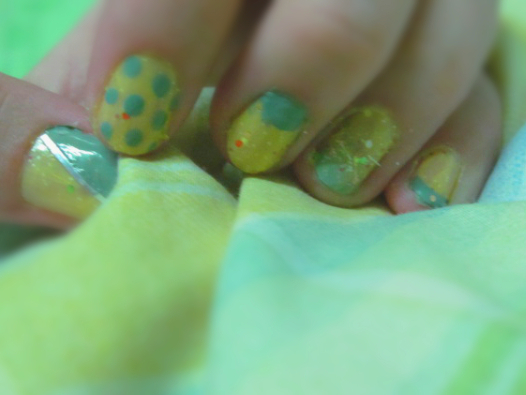 I used a silver strip from the Etude House Sweet Nails Sticker sheet to separate the mint and yellow polish. For the other nails, I did 4 different designs. As above, from left to right, I did (1) mint polka dots (2) half moon manicure, with a mint 'half moon' (3) ombre with mint tips (4) mint french manicure. In case you're wondering, the little orange specks are actually glitter from the Lemon Sherbert polish! It catches light very well (not so obvious in the photo) and looks awesome. 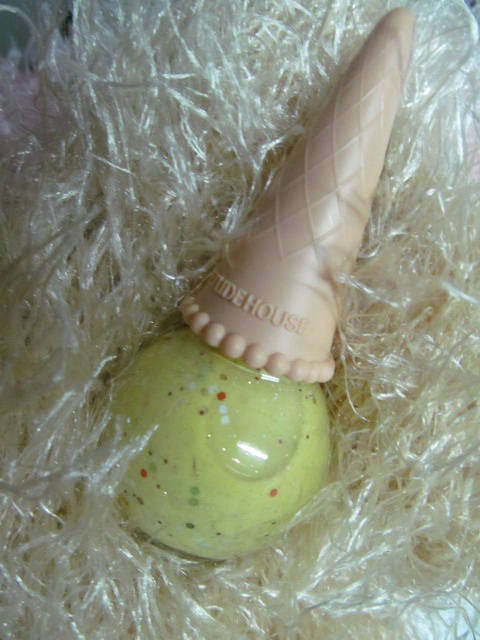 I like how the Lemon Sherbert has the little glitter flecks and sparkly tinsel strands in it. It adds texture to the manicure and the glitters look absolutely gorgeous under sunlight. 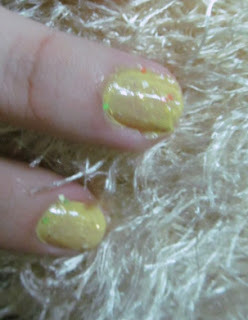 Yellow is a very interesting color too, and offers lots of creative room for nail art and looks. Try it out and have fun with different looks!